Sign up for our user experience newsletter (sent monthly) and get this usability test plan toolkit for free. 27 pages. Version 2, last updated June 2016. A usability test recruitment screener. A statement of informed consent. Instructions for observers in a usability test. A discussion guide for a usability test. A usability test data logging sheet. A detailed checklist for planning a usability test. We even include sample letters to participants for you to send out before and after the usability test sessions! Deliver more professional usability tests and work more quickly with this practical toolkit. Ensure that you're fully prepared for your next usability test. Have a fully completed test plan you can distribute to management and stakeholders. Save time designing usability test forms, templates and proformas. The document includes easy to customise usability test forms. Run a structured usability test that will comply with rigorous standards in usability testing, such as ISO/IEC 23025 "Common Industry Format for Usability Test Reports" and ISO 20282 (parts 2-4) "Ease of Operation of Everyday products". Stop marketing, management or other stakeholders derailing your usability test by getting them to sign up to your usability test plan ahead of the test. Avoid last minute logistical problems by specifying exactly who will deliver what in the usability test. Get detailed instructions on what needs to be written in each section of the usability test plan. Benefit from our practical experience by using the same usability test forms and templates as our usability consultants. “The kit really helped me and my team plan our usability tests more professionally. The layout of the document is well thought through and it is easy to understand and use. It paid for itself really because it helped us improve our process without investing in a number of more costly alternatives.” — SD, USA. Appendix 8: Usability test checklist. 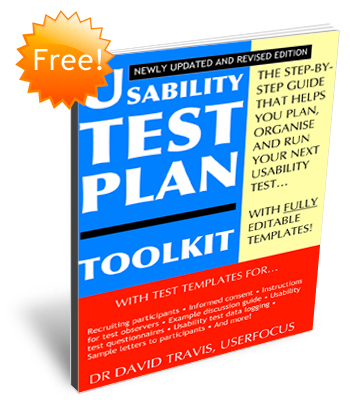 You can adapt the usability test plan template to fit your own corporate style. Each section of the document contains notes and instructions to help you decide what needs to be included. These instructions are formatted as "hidden text", so they won't appear in your printed usability test plan (even if you print it as a pdf).